Lay single sheets of cardboard or plastic, or Vi- to ! -inch-thick sections of newspaper, across garden paths or rows. Cover with the top layer of your choice. A thick layer of newspaper is a greaL weed-stopping mulch for vegetable beds. To plant through the mulch, just cut a small hole in the paper for each transplant. To make the bed look nicer, top the paper with shredded leaves or grass clippings. Note: Water your garden well before you mulch. II you poke holes through the mulch for putting in transplants, water them right at their planting holes. 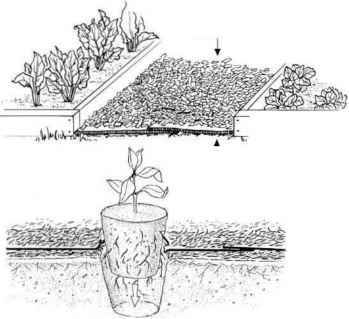 Otherwise, your weed-blocking mulch may keep water from reaching your transplants' roots. At the Seattle P-Patch Community Gardens, program manager Barbara Donnette has mulching down to a science. "We spread a layer of cardboard between raised beds and cover it with wood chips," she says. Cardboard is her favorite bottom layer because it comes in large pieces that slowly deteriorate after they've done their job of smothering weeds. As the cardboard deteriorates, simply add wood chips to the top to keep new weeds from sprouting, Barbara suggests. Plastic works well, too, but it tears frequently, and pieces work their way to the surface, giving the garden a junky look. Cardboard is also an excellent base mulch for a garden bed that's infested with tough weeds like thistles, which can sometimes push their way through light mulches like leaves or straw, it's also a good weapon for reclaiming a bed that's too weed-filled to till or even hand-dig. just cover the entire bed with sturdy corrugated cardboard and top the cardboard with a more decorative mulch like grass clippings or cocoa mulch. After mulching the bed, let it sit for two weeks or longer. The weeds will begin to die off and decompose under the cardboard. When you plant the bed, simply use a trowel to cut through the mulch and cardboard wherever you want to insert a plant. Set the plant in place, and then push the mulch close to, but not touching, the plant stem. As the garden grows, check frequently for weeds near your plants' stems. A few may still be alive and find their way through the hole in the cardboard layer. It's easy to pull these escapees. By the following season, the cardboard will have decomposed, and you should have a nearly weed-free garden bed. If your garden paths are weedy, just chop down the weedy tops and cover the paths with cardboard. Top off things with wood chips for prettier paths. Vegetable and flower transplants grow beautifully in a bed mulched with cardboard to smother out competing weeds, just punch holes in the cardboard and slip the rootballs of the transplants through into the soil underneath. You can use a wide variety of organic materials as mulch to smother weeds and improve the soil in the process. Whatever you use, make sure to spread it at least 3 inches thick to prevent sunlight from reaching the soil surface, says Margaret Sharpe, editor of The Old Texas Rose newsletter. She often mulches in the fall to prevent late-season weed growth, then tills the mulch under in spring at planting time.